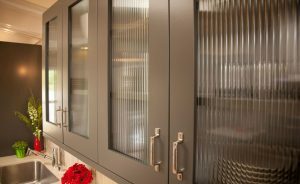 One of our most popular “in shop” service is cabinet door glass installation. In addition to the always popular clear glass option, we keep in stock many popular tinted and pattern glass options. Including: Seedy, Antique, Acid Etch, Rain, Bronze or Grey tint. If we don’t have your favorite pattern in stock, we may very well be able to order in your favorite choice. In stock patterns can be reviewed in our pattern glass gallery.